Picture taken May 20th. 2014 of a young Robin sitting on her nest in a Pear tree next door to our house. Picture taken with a Canon EOS Rebel T3i. Another view of this Robin on her nest. I will keep taking pictures as the eggs hatch and the new family progresses. Picture taken May 21st. 2014. Keeps an eye on me when I'm taking pictures. I'm waiting for her to leave the nest to see if I can get a picture of how many eggs she may have. She shifts them now and then before sitting on them and changes position quit often. Would have been nice to see her build the nest, but I missed that part. Picture taken with a Canon EOS Rebel T3i. Focal length: 250mm, f/7.1, 1/400 sec. Just arrived back to the nest from getting something to eat. Must be boring sitting on eggs all day and night. Making sure I didn't touch them and giving me the eye. Male bird came by to check me out but flew away before I could snap a picture of him. She got a little scared when I tried to get the camera high enough to see in the nest. Couldn't get high enough to see and she took off to the fence behind the tree for a minute or so. Came back for another check and then settled down to sitting on the eggs again. Picture taken May 30th. 2014. Eggs hatched but can't see them from this vantage point. She giving me a bit of a warning. June 2nd. 2014. Checking on the little ones. Don't know how many there is yet. June 2nd. 2014. Change vantage point but was hard to focus as I could not use the view finder and use manual focusing. There appears to be two little ones but at the time I took this picture, only one poked it's head up looking for food. June 2nd. 2014. Mom bringing back some dinner. Still did not get a picture of the second nestling. Picture taken June 12th. 2014. Lunch time for the nestlings and oh my gosh--there is three little ones, not just two. June 4th. 2014. Yup, there is three that I can see. That's going to keep mother busy. 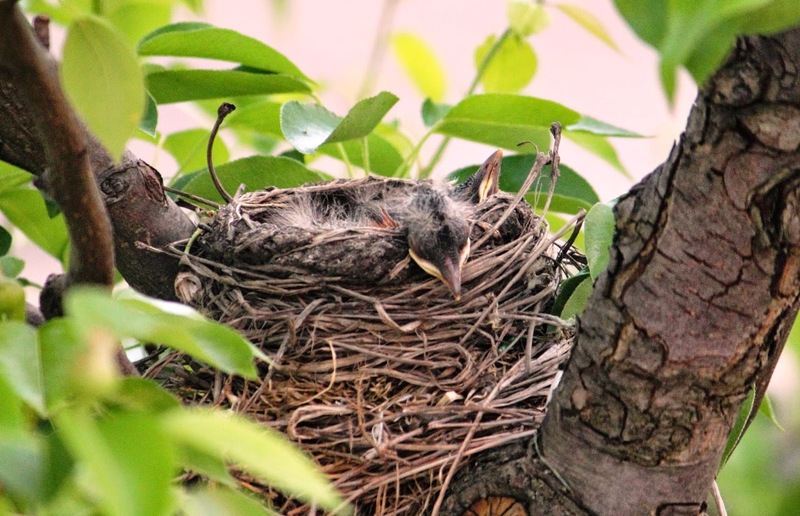 Just how is three going to fit into that little nest as they get bigger? Wrong again. Looking at this picture, I can now see four nestlings. WOW! I guess mother did not lose any of her eggs. The nestling on the right side in the foreground looks a bit on the small side. June 4th. 2014. Nothing for you guys right now. Mom is constantly leaving for food. The little one must not get much as the others have longer neck and bigger mouths. June 6th. 2014. Little ones are getting bigger by the day. Mother is going for food non stop. June 6th. 2014. How all these nestlings will fit in the nest in the near future should be a challenge. June 6th. 2014. Now I'm a bit puzzled now. Is this the Mom and the Dad or two Moms. Could this be a communal nest? Both adult Robins had brought food. Both appear to be the same tone of red on the chest area. I thought females were a more washed out color. 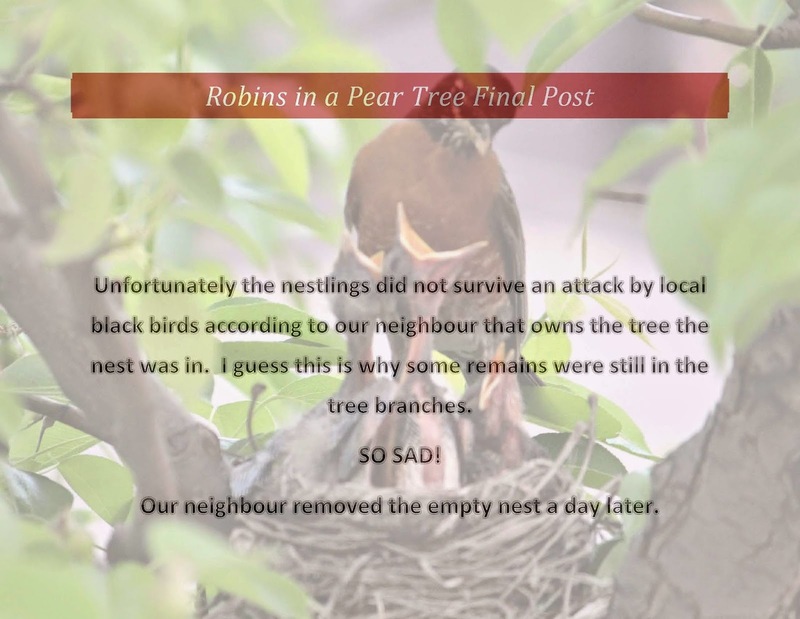 Could two Robins use one nest? 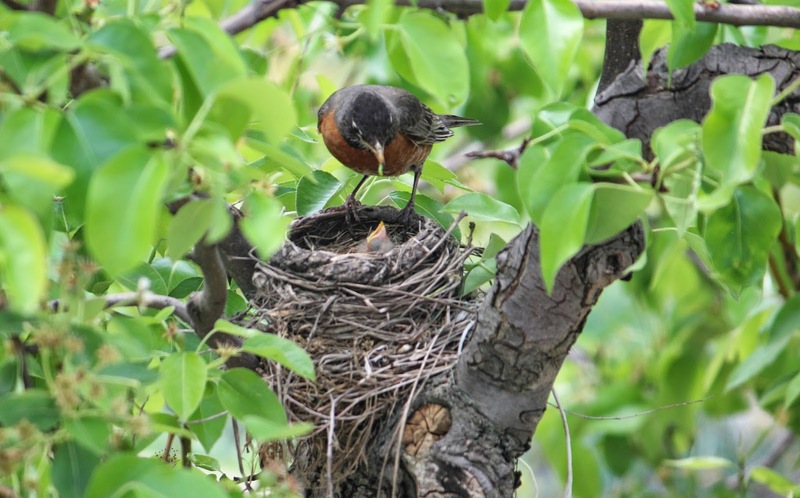 Does a male Robin also feed the nestlings? I guess I will have to research this and find out how to tell a male from a female of if two can lay eggs in one nest. I looked it up on the internet and it seems Robins lay four eggs at a time, one day apart. The male also guards the nest. The male has a slightly darker head so I guess the one on the right is the male. Chest color does not seem to be too much different on these two. The little ones should have flight in about 10 days from now. I will continue taking pictures. June 6th. 2014. Getting bigger by the day and feeding is ongoing but I fear one is missing. I can now only count 3 nestlings and I counted four yesterday. The smallest one seems to have vanished. I did not see anything on the ground so I don't know if the mother disposed of it or something. I can't hold my neck up any longer. Just bring me some food! Maybe if I stretch my head up high enough, mom will get the food here sooner. See! It worked. Lets do it all over again. Robins lay eggs twice a season. Maybe they will come back and try again in this tree.